This is your opportunity to own in one of Hyde Park’s highly acclaimed and most sought-after building, The Hyde. Designed by internationally acclaimed architects WOHA, this level 10, 78sqm one-bedroom apartment plus study and parking is a rare offering not to be missed. 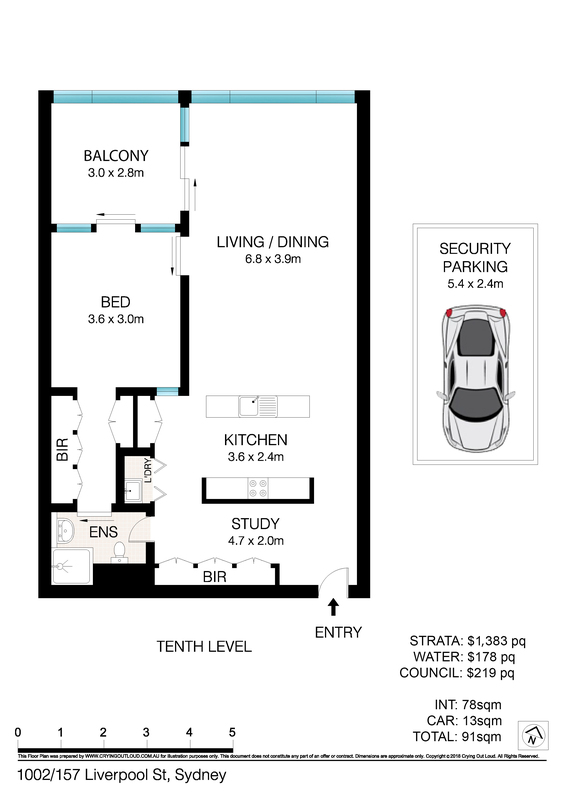 The ever so popular 02 floor plan has one of the widest northern frontages, offering permanent and uninterrupted views over the green canopy of Hyde Park out towards the Harbour and beyond. The open plan living room and kitchen offers plenty of space for living, dining and enjoying the picturesque Hyde Park and Sydney Harbour framed beautifully by floor to ceiling glass windows. Bathed in the northern sun, the spacious and covered balcony, which can act an extension of the living space is perfect for entertaining guests and taking in the magnificent vistas. Facing north, the bedroom features a walk-in robe with plenty of built in cupboard space and a dual entry ensuite shower room. A cleverly designed study nook separated from the living areas offers a quiet space that is free from distractions. – All rooms face north, with access to stunning park and harbour views. – Dual access shower room from bedroom or kitchen, separate study area and an internal laundry. – Contemporary Bosch gas kitchen with quality stainless steel appliances. – Secure parking for one car and private outdoor terrace with gas point for barbeque. – 24-hour concierge, intercom access, library/meeting room and outdoor terrace on the ground floor, 25 metre infinity lap pool, gymnasium, sauna, barbeque area and cabana. The Hyde is a Pet Friendly building that is well served by local transport and conveniently located to major commercial buildings, Sydney’s premier shopping, dining and entertainment hub. Ultra-exclusive and rarely traded, don’t miss out and contact us today to enquire about this property.